Raahe is a town of sea winds in Northern Finland on the Bothnian Bay. 367-year-old Raahe lives on the present, however many things are the same in a suitable manner. The sea and the islands, the old wooden town alleys, as well as numerous events creates each a fine setting for a successful visit. In Raahe there are lots of things to see and experience. Raahe archipelago, beaches, nature and forest trails and magnificent rock formation, Parrinkalliot, in Mikonkari offer unforgettable experiences for people who enjoy nature. In Raahe there are also 250 geocaches! The Old Town of Raahe is one of the best-preserved wooden towns in Finland. The Old Town is a lively part of Raahe. In Raahe you can feel the presence of the sea – a placid expanse of snow in winter and blue paradise in summer. 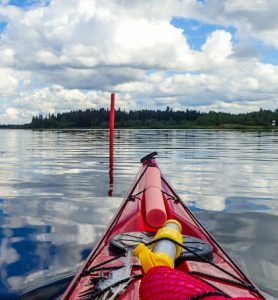 It does not matter whether you are from Raahe or on a journey, you are entitled to pick up yours from many events and interesting places to visit. Raahe archipelago is a memorable destination and part of the Natura 2000 network. Wooded islands near the coast as well as further away on the open seas small islets belongs to the archipelago. Raahe archipelago comprises a total of 36 islands, some larger and some smaller. The archipelago offers a variety of things to do- you can paddle, fish, ice fishing, ski, walk, pick berries, kick sled, skate, snowshoe, or just enjoy drinking campfire coffee in a natural setting. Or would you be interested in moonshine cross country skiing to the Tasku island, fatbike biking or geocaching? In the archipelago, you can also spend the night, as the number of islands has open wilderness huts and lean-tos for year-round use.